1. Uniform dressing over the full strength of wheel. 2. Proper abrasive glaze-free surface on the wheel. 3. Wheel edges free of broken edges. At the same time, from the economic point of view, the dresser becomes expensive when not property designed to meet all the requirements. However, a combination dresser has been conceived to combine quality with economy. The dresser consists of three dressing blades set in a bronze shank (like any other blade dressers) in the form of a sandwich. 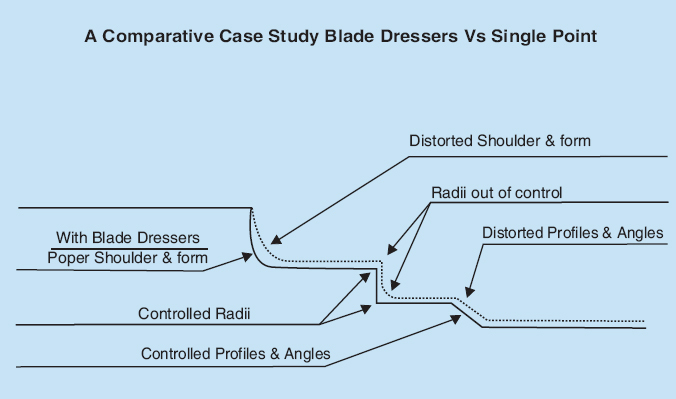 The blades are set with gaps to ensure a proper follow up action during dressing. The middle blade serves as the main load carrying member. The other two blades serve a leading and lagging cutting point to ensure a glaze free dressings. This dresser is supposed to give nearly three to four time than the life span with a normal blade dresser, and can be expected to result in a net cost saving of around 40% on tooling cost.